Though my kid is a born girly girl and loves dress-up and dolls, she also loves cars and trucks, and she’s darn good at building stuff when given the opportunity! Here are five toys that don’t pigeonhole girls and that let them explore their creativity. t Once in a while, someone gives my kid a gift that makes me cringe. I’m instantly wondering how long we’re going to have to keep it and what covert operation I’m going to have to pull off to sneak it out of the house. My biggest pet peeves are things that are super gender-specific, electronics and things that come with a million-trillion pieces (except on the extremely rare occasions when the awesomeness of the toy outweighs one of those traits). t While we don’t have a strict no-technology rule in our house (we watch TV and movies, although at a minimum), we prefer to keep electronics out of everyday play items for our daughter so that she can spend her time being creative with her toys. The truth is that she much prefers it this way. A toy that can do many things is much more fun than a toy that only does one thing (i.e., go beep-beep-boop and drive Mama crazy). So I really have come to appreciate it when people give her gifts that don’t pigeonhole her and that also let her explore her creativity. I also love it when I don’t have to stand over her, supervising her every move. t We recently celebrated Christmas and my daughter’s birthday (two weeks later — yes, shoot me). It was major toy overload, as expected, but we made it out alive and luckily picked up some pretty different and creative stuff. Here are some of my daughter’s favorite new (mom-approved) toys! 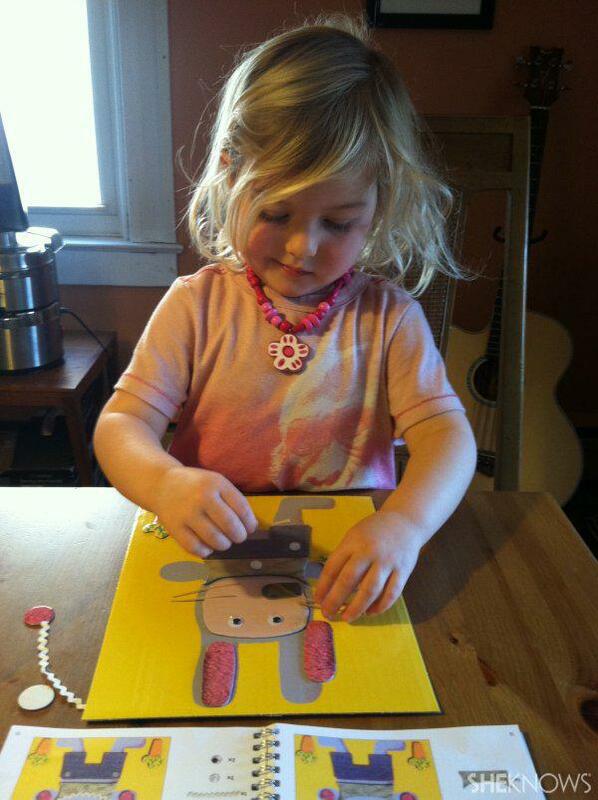 t I’d had my eye on GoldieBlox for a while. I mean, have you seen their ad campaign? It’s pretty solid. If you’re looking for a toy that will get your 4- to 9-year-old daughter interested in building, this is it. It comes with a read-along story that instructs you how to build a parade float, so it makes your child really feel like she is a part of the story as she builds the float. GoldieBlox’s founder, understanding that girls tend to be very interested in stories and characters, built the toy this way for that very reason. GoldieBlox also provides options to create several other structures, so there’s lots to do. I can see this toy being appropriate for many ages. You can participate with your child by reading the story and having her make the craft, or she can make some of the other structures alone by looking at the pictures and reading along, if she is of reading age (GoldieBlox, $20). t At first glance, a bead kit seems like a terrifying gift for a child aged 4 or more. But My Big Alphabet Bead Box is pretty awesome. The key is the big beads. Small beads wouldn’t have made it through the front door. (Hello, cleanup nightmare!) We had great success at some bracelet making and necklace making right away. After I got finished with my necklace, I left my daughter unsupervised to finish hers. The string has a metal tip, so getting it through the beads is much easier and makes this kit great for working on those fine motor skills. My daughter only needed help starting her necklace and closing it, but her little hands were able to string the beads easily, so the activity kept her occupied for a good 20 minutes. And in all seriousness, pretty much anything that keeps my daughter occupied for a solid 20 minutes is worth spending good money on (Amazon, $25). t I spotted this pink foldout castle a few weeks before Christmas at Home Goods, but my shopping was already done, so I passed. Sure enough, it wound up at our house anyway when my daughter received it for her birthday in January. What’s really cool about the castle is the fact that you can open it up so the characters can play in all the different rooms. What’s even cooler is that it only comes with a few furniture pieces, two horses and two people (a boy and a girl) — so cleanup takes about 30 seconds, and the child can easily do it herself. The only downside is the fact that I have to be “the Prince” a lot, but at this point, I’m pretty used to it (MelissaAndDoug.com, $50). t This kit for creating collages is appropriate for kids aged 3-6, and it’s completely, amazingly cool. Yes, there are some pieces to look after. Thankfully, my daughter was so engaged in the creative process that she took diligent care of each of them. The kit comes with four boards, each with a picture of an animal. It also comes with a small picture book and pieces with which to decorate the animals. I was able to decorate the first animal with her and then let her have at it. It was cool to watch her intensely follow the picture directions at some times and then make her own creations at other times. But the best part was seeing how focused and concentrated she was while using this toy. The only thing I didn’t necessarily like was the fact that the kit came with a glue stick. I’m not sure why you would want to glue anything onto anything else because then, you couldn’t use it again. We tossed the glue in our craft box and called this toy an A+++ (Amazon, $23). t This is not a prince-and-princess story. I repeat: This is not a prince-and-princess story! This is a book about a young princess, Klara, who goes on a search for her father’s lost happiness and meets many interesting friends along the way. I won’t spoil the ending, but it’s super-sweet and totally original. My daughter was also given a matching doll (there are many different characters to choose from), which really brought the story to life (Ikea, $5 for the book, $5 and up for the dolls).